The "You Can Never Have too Many Books" Contest! ...and I called it that, because I figure $25 will get you QUITE a few books, if you're a smart shopper. ;) (Which of course you are). But you can also use it to get a jump start on your Christmas shopping. All you have to do is answer a few easy, easy questions for a chance to win. Have fun! Sroll down to read the entry rules, then scroll down further to the form to enter! And good luck! Entry Deadline for contest: midnight, EST, November 15th, 2013. One entry per email address/ household, please. More than two entries from the same email address or IP address will disqualify the entry. Winners will be announced on November 15th, 2013 and notified by email, posted on Facebook, and posted on this page. Good Luck, my sweets! 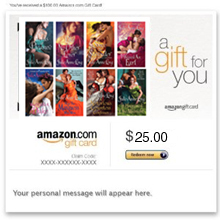 Win one of THREE $25 Amazon gift cards! Do you normally read my books in paperback or ebook format? If paperback, from which retailer(s) do you buy them? If ebook, which e-book retailer do you normally buy my books? Which Pennyroyal Green Character or characters would you like to see featured in a novella? Note: if you enter a contest on this website, you'll be added to my mailing list. Your email address is always safe with me. about many of your favorite Avon authors.